CropLogic CEO James Cooper-Jones, right, and Scott Barclay, CropLogic's new western regional sales manager, talk about one of the company's crop-monitoring apps on Cooper-Jones' smartphone after a press conference in Twin Falls, Idaho, on Oct. 25. 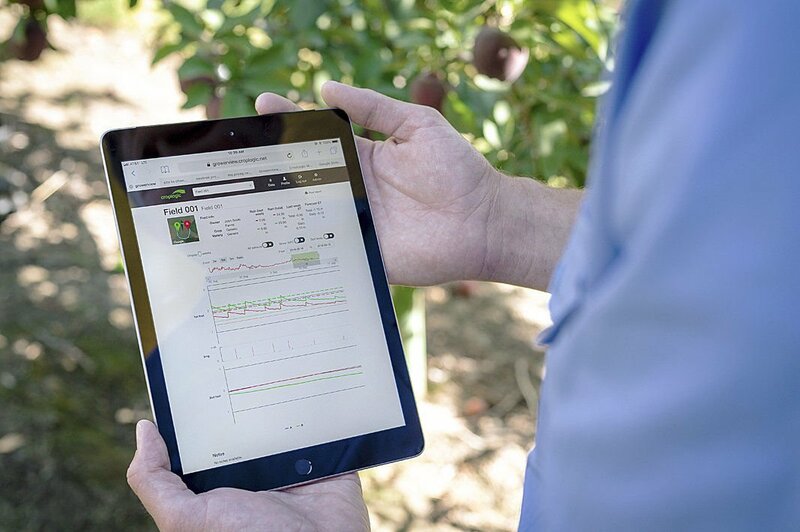 CropLogic realTime Growerview app helps farmers manage their soil moisture levels by providing accurate and concise data in an easily digestible format. TWIN FALLS, Idaho — With a vision of becoming the leading provider of agronomic services for farmers around the world, CropLogic — a New Zealand-based agricultural technology company — is expanding its footprint. The company was formed in 2010 to further develop and commercialize intellectual property from the New Zealand Institute for Plant and Research Limited. In 2016, it moved into the commercial arena and has brought its technology to the Columbia Basin and Southern Idaho. In late August, it opened up shop in Australia and is pursuing new markets in China and the U.S. In late October, the company announced it is locating a new regional sales office in Twin Falls. It is already providing aerial imagery to growers in Southern Idaho and wants to expand its services due to the excellent response, James Cooper-Jones, CropLogic CEO, said. “We are continuously trying to drive cutting-edge technology to our growers,” he said. That technology includes sensors in the field to monitor soil moisture and software that can relay real-time data to a grower’s smartphone or computer. It also includes infrared and near-infrared aerial imagery that can detect crop stress two or three weeks before it can be detected by the naked eye. The technology allows growers and agronomists a simple system to define areas of stress, but the technology is sophisticated and a lot of it is based on 30 years of research, Cooper-Jones said. Quoting an associate, he said for agricultural technology to work, it has to be complicated but have a simple interface for growers. “It’s that powerful algorithm where the smarts are,” but the data is accessible through a desktop or mobile application, he said. Mathematical equations provide constant data that provide for predictive modeling to inform growers’ decisions on irrigation and managing pests and disease, he said. While services in Southern Idaho are currently limited to aerial imagery using airplanes, services in the Columbia Basin also include soil moisture monitoring. The company has 140 to 150 clients in the basin, varying in size from some of the biggest growers to small family operations. In just two seasons, monitoring sites have grown from about 80 to more than 500, he said. Crop Logic’s annual revenue in the Columbia Basin is $1.6 million to $1.8 million and growing, he said. The company merged with Professional Ag Services — which has operated out of Pasco, Wash. for 30 years — in what has been a “very happy marriage,” he said. Its technology is now being employed in potatoes, onions, carrots, forages, tree crops and wineries, and the company is seeing tremendous growth in clients growing hops, he said. The company is serving a significant portion of horticultural growers in the basin, having a market share as high as 30 percent in some crops. The regional focus in Southern Idaho is going to be a little different, primarily applied to potatoes and forage crops such as hay and corn. “But the technology is very versatile and can be adapted to those crops,” he said. The company combines its technology and crop science with on-the-ground agronomic expertise to build a technology platform that improves crop yields and addresses the issues growers face in an increasingly challenging global environment. The goal is to increase yields through better use of resources and more accountability, and that demands digital technology, he said. “The trend everywhere is very much a digital focus,” he said. It’s being driven by increasing demand for food in a growing global population, stresses on water resources and the lack of additional available farmland, he said. The company was founded on 30 years of research, and research continues through partnerships with universities and colleges — as well as collaboration with growers and regional agronomists. Cost of CropLogic’s services to growers depends on what is required, but it’s definitely affordable with a clear return on investment, he said, adding that the company has a lot of repeat customers.